World’s largest cancer fighting event goes into the wee hours! 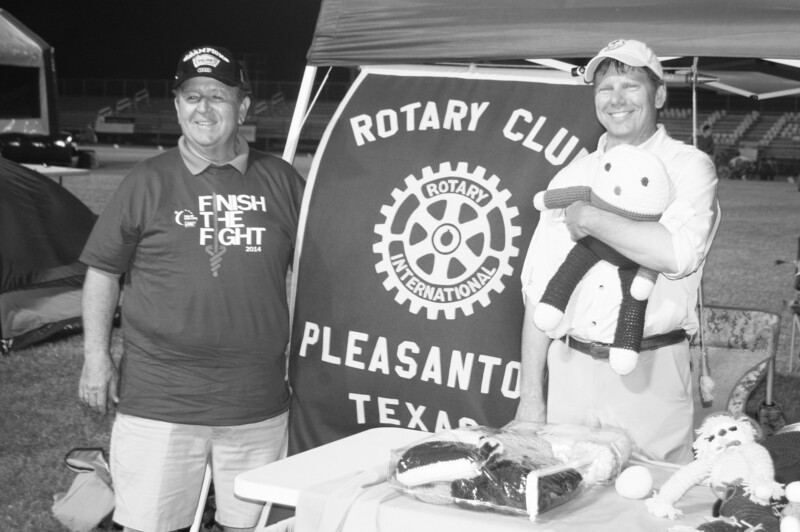 Craig Dowdy and Bobby Kinsel participated in last year’s Relay For Life representing the Pleasanton Rotary Club. Jourdanton, TX – Atascosa County walkers will go into the wee hours of the night to fight cancer during the American Cancer Society Relay For Life of Atascosa County. This “celebration of life” brings the community together –alongside of countless other volunteers in the 5,000+ Relay communities here in the United States, and in twenty other countries around the world- in a unified effort to fight cancer. A community fight-back event that symbolizes the fight cancer patients face after they are diagnosed with the disease. Enthusiastic teams will gather at Jourdanton’s High School stadium for an eight hour Relay to join the fight against cancer from 6 p.m. on Saturday, September 12 until 2 a.m. the following morning. Relay For Life is a lifechanging event that brings together more than 4 million people every year to celebrate the lives of those who have battled cancer, remember loved ones lost, and empower individuals and communities to fight back against a disease that takes so much. Relay For Life opens as cancer survivors (anyone who has ever been diagnosed with cancer) walk or use a wheelchair to complete the first lap. This is an emotional time that sets the stage of the importance of each participant’s contribution. A festive atmosphere develops around the track as walkers make new friends and spend time with old ones, the Relay heats up and the camp-out begins. An atmosphere of camaraderie is created with team members entertaining each other: eating, playing games and, of course, walking for a great cause. Highlighting the evening is the Luminaria Ceremony which takes place at dusk to honor cancer survivors and to remember those we have lost. Our Luminaria bags will line the track and are left burning throughout the night to remind participants of the importance of their efforts. For information about how to support a team, form a last minute team (yes, there’s still time), or become involved in day of volunteerism at the Relay For Life event, please visit www.RelayForLife.org/ AtacsosaTX or simply call your local American Cancer Society staff representative at (210) 557- 9185. For more information about cancer and/or the Society’s Mission to eliminate cancer, please call the American Cancer Society’s 24-hour help-line at 1-800-227-2345 and/or visit www.cancer.org. The American Cancer Society combines an unyielding passion with over a century of experience to save lives and end suffering from cancer. We save lives by helping people stay well by preventing cancer or detecting it early; by helping people get well by being there for them during and after a cancer diagnosis; by finding cures through investment in groundbreaking discovery; and by fighting back as we rally lawmakers to pass laws to defeat cancer and by rallying communities worldwide to join the fight.